Life is full of adventure, isn't it? Throughout the years since I started my own family, we have certainly seen our fair share. We've traveled across the country more times than I can count, creating irreplaceable memories along the way. The big adventures, the little adventures... we have enjoyed them all. But we all have that one adventure that we dream of, don't we? For my daughter, she dreams of going to Disneyland or Disneyworld. Our previous Disney trip was long before she was ever thought of, and while she loves looking at the pictures and memories we created then, she dreams of having the chance to see it firsthand. She dreams of meeting Minnie and all the princesses... riding the rides and eating the sweet treats that she has heard so much about. Her other dream? Finding a real life unicorn! Hey... one dream at a time though right? My son has a lot of big adventure plans. He wants to visit his birthstate of California and catch up with old friends. He wants to once again hop aboard an Amtrak and see the sights from one end of the country to the next. He dreams of going to New York to meet his favorite YouTuber. He truly want to do it all! My own dream is nothing fancy or grand... more than anything I would love to get an RV and travel across the country with my family... from Roswell to New Orleans and everything in between. Taking in the sights with the people I care about most. If you ask me, those are the best kinds of adventures to experience- those spent with our friends and family. While we might have to wait a little while for all of THESE adventures, we love enjoying adventures on the big screen while we wait. And the onscreen adventure we're MOST excited about right now? “Smallfoot” stars Channing Tatum (“The LEGO® Batman Movie,” the “Jump Street” films) , Zendaya (“Spider-Man: Homecoming”), Common (“Selma”), LeBron James (upcoming “Space Jam 2”), Danny DeVito (“The Lorax,” Oscar nominee for “Erin Brockovich”), Gina Rodriguez (“Jane the Virgin”), and Yara Shahidi (TV’s “Black-ish”). Talk about a fun adventure, right? We love a good Yeti story in my house, from books to 'Yeti In My Spaghetti', we cannot get enough. Needless to say, the excitement was strong when we first learned about this new movie. For us, a Yeti is perhaps the most famous mythical creature there is, so we love this fun little twist that we are the same for them. And with such great talents, we KNOW it's going to be a must see. We've been counting down the days and cannot wait! Thankfully the wait is almost over! Smallfoot will be in theaters everywhere September 28! What are some adventures you or your children dream about? 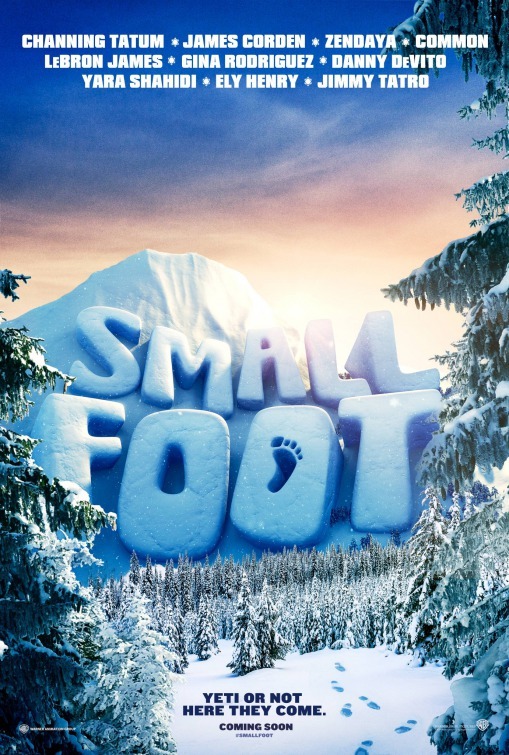 Who in your life is excited to see the new onscreen adventure in Smallfoot? This looks like a great movie! My adventure is to take a road trip across the country, stopping to see unusual sites along the way!